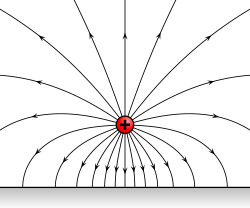 An electric field is generatit bi electrically charged pairticles an time-varyin magnetic fields. The electric field describes the electric force experienced bi a motionless positively electrically charged test pairticle at ony pynt in space relative tae the soorce(s) o the field. The concept o an electric field wis introduced bi Michael Faraday. This page wis last eeditit on 12 Dizember 2013, at 02:59.